In March 1917, B Company disembarked from their troopship at Durban, and Dad spent several weeks there before continuing on to India in April. During his time at Durban he met a young lady called Vera, and they became friends. Vera was married, with a young child. Her husband was away working in a diamond mine. Dad met Vera's family and they spent a lot of time together. 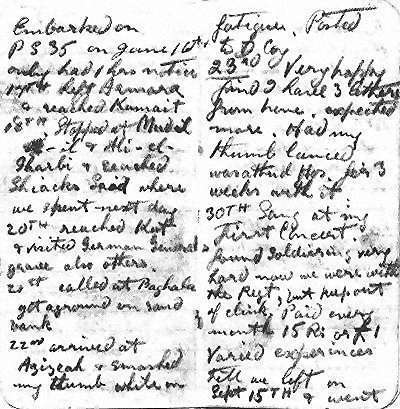 Dad describes some of these events, including a reference to Vera, in the diary (right) in which he recorded some of his experiences in the War. Unfortunately only parts of the diary remain. Click on the diary for a full transcription of the surviving pages, and for links to photographs of Vera and her family.